What is the definition of circle? A circle is defined as the locus of a point which moves in a plane such its distance from a fixed point in that plane is always constant. 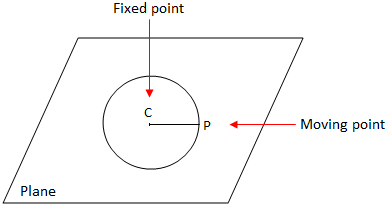 For example: If a point P moves on a plane in such a manner that its distance from a fixed point C (say) on the plane is always the same then the locus of the moving point P is called a Circle. The fixed point C is called the Centre of the circle and the constant distance CP is called the Radius of the circle.